Now I am singing that, but it’s a bit of a different journey. A bit more like a marathon I’d say, as opposed to the couple of miles I did that day. Although I will say, thinking back to the last 20 weeks – time has flown. I know some of the bigger things that are planned for the next few months as well, and I am so aware that the second half will probably go even faster! What’s even weirder to think is that if on the off-chance I had the baby early, then I am more than halfway. How did that happen? The first of the 2015 YWAM Newcastle babies was born yesterday, and the realisation that “I get one of those in 20 weeks” (as someone said to me) is so nuts! Food Cravings: Nothing too crazy. I think the most ongoing, consistent thing I’ve wanted from the first couple weeks I knew I was pregnant until now is very cold drinks. Water, juice, Sprite, iced coffee. The colder the better. I have had a couple hot coffees, but those are very rare. Food Aversions: Eggs. Plus super salty things. We had a dinner this week, and it had quite a lot of soy, which is very salty. I couldn’t stomach it at all. Symptoms: Still the lovely allergies. I am trying not to focus on them too much, and I am also trying very, very hard to hold in sneezes. It seems that once I sneeze, it all goes downhill from there. I also have been getting a decently sore back/bum from sitting in these one chairs at the warehouse after about 10 minutes. The whole area goes to sleep, and I have to get up and walk around. So I will be avoiding those chairs for now. New this week: Robbie felt our little bean kick! It was so cool! I was laying in bed, and the baby started kicking up a storm. I thought he surely had to feel these! I could feel them on the inside and on my hand on the outside. So Robbie came in, and we waited for that first little jab. Sure enough, he felt a few of those little jabs, and it was such a cool moment. Also new this week – nesting. I knew about it, but this was the first time I started to feel the beginnings of it kicking in. We rearranged our room to make space for the cot we bought on Friday! We still have to paint it before we get it all set up, so no pictures today. I’ll post photos as we set things up, though. Looking forward to: Ultrasound in 2 days! I am so excited, and I will definitely be posting some little snapshots of our cutie! Robbie’s birthday is in a couple weeks, and I am looking forward to that as well. When I first found out I was pregnant, I sort of looked through the calendar at how far along I’d be at different points in the pregnancy. I remember thinking, “Oh cool! I’ll be 22 weeks when Robbie’s birthday rolls along!” It’s pretty crazy that it’s coming up so soon. Exercise: Walking, walking and more walking! Yesterday, I was watching my friends’ older boy (the ones who just had the baby), and I took him for a walk in his pram. I walked up to our other location to pick up our car from where Robbie had it. 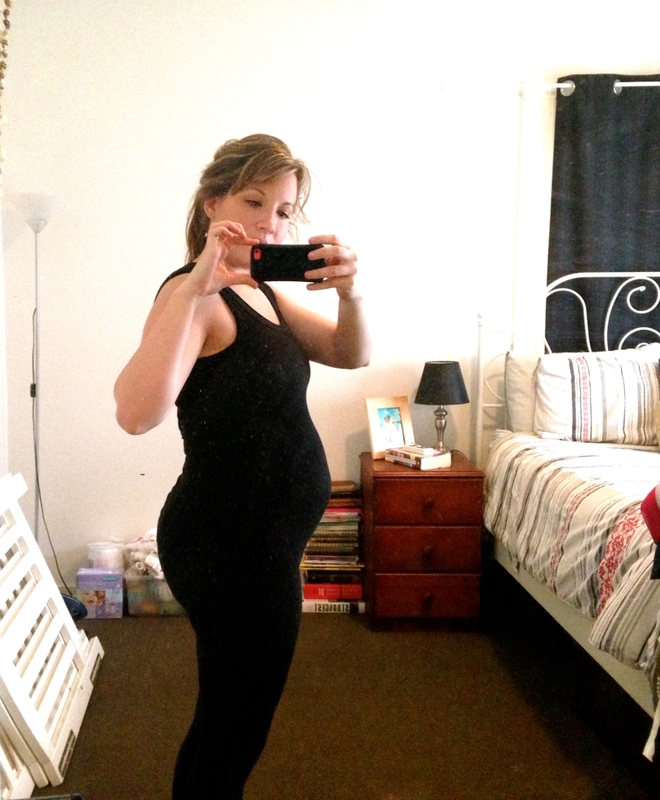 Pushing a pram up a massive hill 20 weeks pregnant = no easy task. Plus following him around and carrying him a lot. I think kids could easily be built in workout machines if you let them. I definitely am recognising that I need to know what my body is saying as I do different things, though, particularly lifting and utilising my back. I am feeling it’s necessary to be very particular with using my legs more and not straining my back as I adjust to my new centre of gravity. Books I’m Currently Reading: Still working on the two from last week.